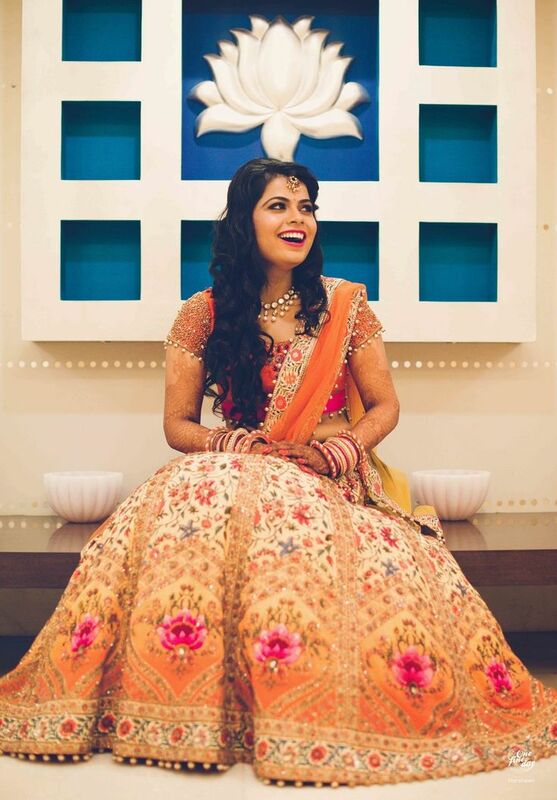 Take a look at 20 stunning bridal lehenga designs that truly represent Indian traditions. So, are you ready to be mesmerized by the blings of bright red, pinks and oranges? An Indian bride is an epitome of coyness, and naivety. She wears a bright red lehenga on her wedding day. She also wears a beautiful bridal makeup that accentuates her gorgeous eyelashes, black eyes, Indian skin-tone and pretty lips. Black kajal, black mascara, red lipstick and flushed cheeks! She decorates herself with gold ornaments and this is a true representation of an Indian bride. Genuine red, and often, pink or orange, these are the the colors of a traditional Indian bride. At a pre-wedding ceremony, the same bride will be seen getting mehndi applied on her hands and feet, also undergoing various other bridal rituals. Dressed up in yellow or green, the auspicious colors associated with Indian festivities. As a part of the Indian bridal makeup, the girl wears bangles on her wrists and sticks a big bindi in the centre of the forehead, closer to the point where the eyebrows meet, and several tiny red and white small bindis above the eyebrows. The hairdo typically comprises of a simple hair bun that compliments her dress. The bride can also opt for a floral arrangement, preferably- red roses or jasmine flowers to beautify the entire hair-look. The bridal makeup is also done keeping in mind the color and designs on the bridal lehenga. The makeup of the bride is meant to be exclusive. Afterall, she has to stand out of the crowd! Isn’t it? 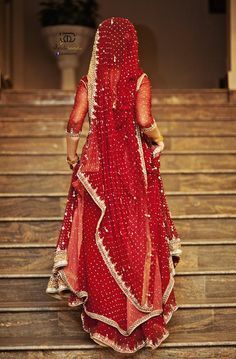 An Indian bridal lehenga, which is a choli and a long skirt (also called as ghagra), that truly reflects the traditions of India is a bright red colored attire with paisleys done in zardozi. The fabric could range from silk to georgette to net, depending upon the embroidery. You can opt for a red lehenga, heavily adorn in stone and kundan embroidery or go for a pink lehenga in raw silk, which is enhanced in zari applique embroidery all over. Even aari work or thread and sequin embroidery can look really contemporary. If you are looking for a simple twist, then we recommend an orange lehenga in silk adorn in stone, French knot and kardana embroidered butti all over. Take a look at some of the styles and designs that are bound to mesmerize you. They are so Indian and heavily bridal in their refrains. So, shop for one today but don’t forget to wear a look that goes perfectly well with the traditional Indian theme.